People walking from Brand to Heimbourg, via the Clos Jebsal, can see very easily the soil change between these three vineyards and how quickly this occurs as one crosses a rural road. Fault lines run North to South but also East to West in Alsace. The Jebsal is delimited by two of them, only distant of 150 yards, which makes the Jebsal a very small single vineyard of about 3 acres. Facing full South, on terraces on a steep hillside, the rich marl/gypsum soil contains enough humidity to allow the development of noble rot each vintage. The Clos Jebsal produced VTs and/or SGN every single vintage since 1989. Only 1987 and 1988, the two first years of production, weren’t late harvest wines! In 2010 we produced, from 2 selections, this VT and a very rich SGN. The VT fermented to a classic balance alcohol/sugar. 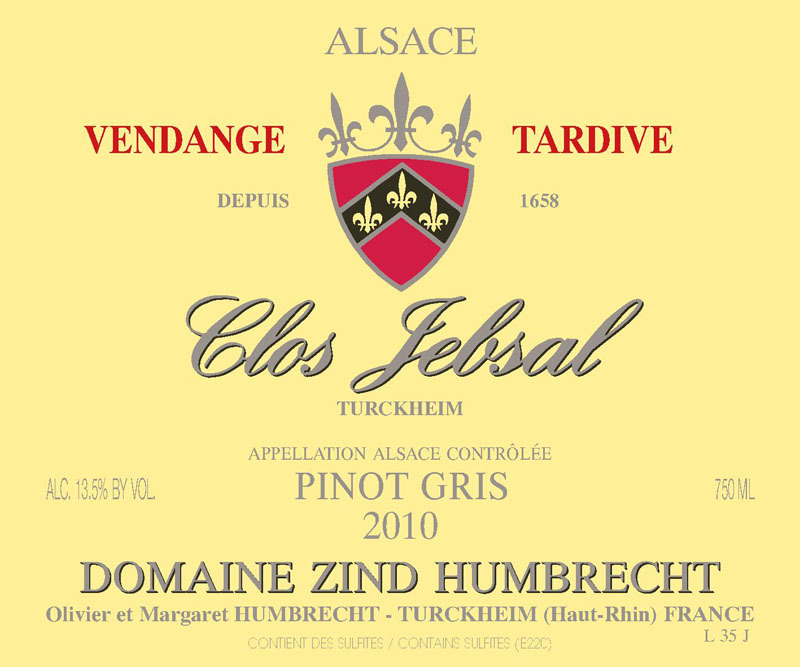 3/2012: the Jebsal is never the earliest of the Pinot Gris to express its potential. It has a classic nose with lots of minerals and light toasty aromas. It is very easy to think that this would be a dry wine on the nose. The palate shows classic structure, at least the kind of structure we are looking for in late harvest wines: great acidity, palatable but refrained sweetness, and long aftertaste. Just like the nose, the palate is still to open, but this is expected in a wine that should perhaps reach apogee only in many years.